Exciting news! 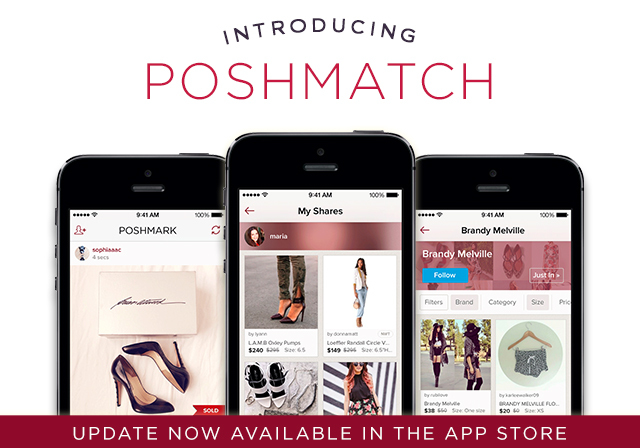 We have released a new and oh-so-gorgeous version of the Poshmark app into the App Store. Introducing PoshMatch, a dynamic and new personalized shopping experience that constantly updates to reflect what you and your network are styling, following, and liking, alongside items that match your unique style. Shop Your Shares: Sharing is styling! Your shares are now collected in the Shares tab in your closet. Not only are you now curating the best PoshFinds like a personal stylist, but you can shop the shares in other closets. Follow Your Favorite Brands: Don’t miss out on the latest from your favorite brands. Follow your brands and click “Just In” to shop recently added items first. ‘About’ Section on Profiles: Now all closets now have a dedicated page that features your profile photo, location, website and brands you follow. Personalized Home Feed: Your feed is now prettier and more functional than ever. The more you interact with Poshmark, the faster we can learn about your style and enhance your shopping experience. Head to the App Store to download the latest version of Poshmark so you can enjoy the new personalized shopping experience. Stay tuned as we work to roll out these enhancements for all users and those Android devices, as well! Friends don’t let friends pay full retail. Invite your friends to shop their favorite brands on the new Poshmark. Bonus! You may get some referral money in exchange. Win-win! Woohoo! Love the video and this app update! Go team! Thanks, Wenrella! Enjoy and Happy Poshing! Thanks, so much! Our community is the best. Happy Poshing! Imlove the updates, thank you! Glad you enjoy them and thanks for the love! Happy Poshing! Good job Poshmark. I love that you are always updating to stay relevant! Cute video too! Thank you! Glad to hear you are enjoying the updates. Happy Poshing! Rest assured, it’s coming soon! Stay tuned and we will let you know as soon as it’s available. I need help with the app and don’t know where to leave a comment/question! Any PM user can answer me, and I’d be super happy. What’s a normal amt of time for downloading the app on an Android device? After at least 30 min., I got concerned something wasn’t working properly (and my limited data was getting sucked up for no good reason), so I crashed the download. Anyone else had any problems with this download? Is it normally a long one? Is it supposed to be 4mb huge, or did I select something wrong? Again, since PM doesn’t have a technical support line, I’d appreciate anyone answering me with any help! Thank you so much gals! I love to shop here and want to set up a closet now. But how, if I can’t get the app on my new phone!? Hi Holly, you can email someone at support@poshmark.com and someone can assist you. Thank you! I will certainly do this! Thanks you for the kind note, Leslie! We have the best community! Thanks Posh Team!! You are always improving! I enjoy both buying & selling in the app! Regarding sharing is styling..,I share to “care”. I would not necessarily recommend all of my shares for styling however. I don’t want my shares to paint a picture of my style as they aren’t always. What do you think? If people follow my shares as my style suggestions, it might make me change the way I share. I too totally agree with that part. Hi Jan! Of course you can utilize these features in any way you like, whether it be to show love to friends or to express your personal style – or both! Since your shares are now a part of your profile, they have a unique ability to appear as recommendations of good Posh Finds more than before. Hope that helps!